Monday 10/8 - This week starts off the messages of reversed Whale, which lets us know that it’s time to tune out the rest of the world and tune more deeply into our inner knowing and our connection to Spirit. If you’re finding that the “noise” from “ou there” is pulling intensely for your energy and attention, raise your own voice in song or chanting to ground yourself back into your body and to reclaim your sovereignty. From this place you’ll be more able to allow your inner wisdom to flow forth and guide you. Tuesday 10/9 - Dragonfly is the master of illusion and dreams. When it flies into your cards, it’s usually a sign that it’s time to look a little more closely at your inner and outer worlds to see if things are really as they seem. Have you been tricking yourself into thinking that your practicing self care when you’re really just being self indulgent and maybe even a little self destructive? Perhaps you’ve been playing the hero in a situation, when really you have ulterior motives? Or maybe you’ve simply been lying to yourself about where your passions truly lie. Whatever the case may be, today’s the day to pull back the curtain and get really honest with yourself about any and all areas of your life that may be out of alignment. Wednesday 10/10 - Have you been unable to catch your breath lately? Feeling off center and frazzled? If so, Dolphin reversed encourages you to give your body the simplest and most vital source of nourishment it craves--deep, healing breath. Take some time out today, even if it’s only a few minutes, to set everything else aside and simply connect with the rise and fall of your chest. Inhale and exhale slowly and as deeply as you can to reconnect to yourself and the precious life force that runs through all living things. It is such a gift and taking time to acknowledge it with a little bit of love and gratitude can go a long way towards shifting your perspective and energetic state. Thursday 10/11 - When Hummingbird shows up in the reversed position, it’s usually a sign that you’ve forgotten what a joyful experience this life can be. Especially with the heaviness of the news and our go-go-go pace, it’s easy to feel like we can’t stand up under the weight of the world. But your light and joy is what can bring about positive shifts and healing for our planet and global community. Practice self care today in the form of simple pleasures to remember the joy you felt as a child. Once your cup is full, you can serve others from the overflow. Friday 10/12 - Grouse seems to be echoing the messages of Hummingbird as the week comes to a close and encourages you to move your body to connect with yourself and Spirit. Dance, skip, take a long walk, or dive into a flowy yoga sequence. If your movement is restricted, use the power of your mind to visualize yourself in physical expression and tap into the magic and mystery of being a soul held in the soft flesh of a human body. Saturday 10/13 - Sometimes the weekends are for sleeping in and lazing about but not today. 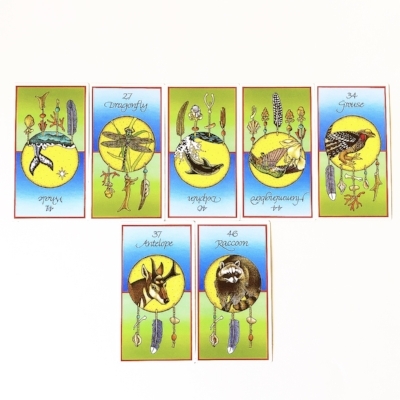 Antelope ask us to spring into action and to take whatever steps are necessary to move closer to your goals. What can you do today to invest in your dreams and visions? Pick one or two tasks that will help you cultivate the life you desire and put your whole heart into completing them. Your future self will look back and thank you. Sunday 10/14 - Raccoon medicine is that of the “Generous Protector” and endows up with the ability to offer our strength to others with compassion. Is there someone in your circle who might need your support today? Even a simple gesture like a phone call to let someone know that you care or offering your ear can make a big difference to someone with a heavy heart. Just be sure that give from a place a true generosity and in a way that empowers, rather than enables, those you help. Monday 10/1 - On the first day of this new week and new month and on the tail of an incredibly emotionally charge week, it makes perfect sense that Horse would show up to guide us. Horse medicine is about Power and it’s a good time to ask yourself what that means to you? Who do you know that embodies true power and what does that look like? Does it include compassion, humility, and the ability to maintain a peaceful center, even in the midst of a righteous fight for justice? If not, it might be worth examining from where you draw your power, how you chose to channel it, and if that energy is being used most effectively and for the highest good. It’s work we all must do, no matter where we are on this journey of life, and we must do it with an honest and courageous heart. 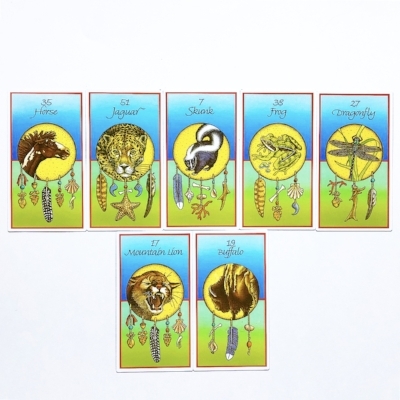 Tuesday 10/2 - Jaguar supports the message of Horse and adds a focus on Integrity. To move through the world with Integrity, your actions and words must align with and embody your deepest values and truths, and the first step in making that happen is uncovering what you truly believe in and what motivates your choices. Take some time today to get clarity around what’s most important to you in this world and let that insight, along with the compassionate wisdom of your heart, guide you in all that you do. Wednesday 10/3 - Skunk speaks to us of Reputation and being aware of not only what we’d like other people to think of us, but what energies we may be putting out into the world, consciously or unconsciously, that let people know who we are before we ever utter a word. Just because your speech is kind doesn’t mean others can’t feel your silent judgements. Even if you never actively use your power over others doesn’t mean your sense of superiority isn’t sensed. Are you giving mixed signals by leaking a type of energy that you have no intention of acknowledging or being accountable for? Take a little personal inventory today and ask yourself if your talk is backed up by your walk, on all levels. Perfection isn’t the goal, but continuous practice and progress is the path of healing and growth. Thursday 10/4 - Frog medicine is so sweet and all about Cleansing the mind, body, and spirit. A vital part of self-care is releasing toxins from your life and this can happen on so many levels. Right now, it seems the call is to allow the tight and knotted up spots in your energetic field to soften. To release anything that is causing you pain, so that you can take the next right steps from a place of clarity. If you think a physical de-cluttering process, nutritional cleanse, or meditation practice might support you, by all means go for it. It is time to release anything in your life, be it thought patterns, materials, habits, connections, etc., that do not serve your healing, growth, and transformation. Friday 10/5 - Beautiful Dragonfly shows up just in time to support the process of transformation by helping us clear away the Illusions we live under and within. If you allow it, Life can be a constant process of having cloudy lenses removed from your eyes bringing you closer and closer to true and clear vision. What have you been taking for granted? Where are your blind spots? In what ways do you need to get much more honest with yourself in order to live as your very best self? Saturday 10/6 - Mountain Lion can be tricky medicine to swallow for many of us, particularly those of us who are reluctant to step into positions of Leadership. Standing out from the crowd can feel risky and being in a position to guide others involves a great deal of responsibility, but we can always begin with ourselves and model the types of shifts we wish to see in the world. It’s often as simple as coming back to our hearts, asking what truly serves the greater good in each moment, and doing the thing that is right, even if it’s not always easy. True leadership is often much quieter, more gentle, and more humble than most would ever imagine. Sunday 10/7 - Buffalo medicine is that of Prayer and Abundance. It is a reminder of the sacredness of all life and all experiences and encourages us to take time to connect quietly with the universal heartbeat that makes the flowers open and closes and your very own lungs expand and contract. When you connect with this sense of Oneness, you invite miracles into your life. Monday 9/24 - Have you been operating from a place of tunnel vision? Are you so focused on what you feel you need to achieve that you’ve lost sight of your place in the bigger picture? Buffalo in the reversed position indicates that it’s time for you to soften into a more receptive place and open your heart to receive that abundance that already envelopes you. Today happens to be a full moon as well so it’s the perfect time to loosen your grip and let go of anything that is holding you back from living in true alignment with yourself and with Spirit. Tuesday 9/25 - Antelope in the reversed position echoes the messages of Buffalo and asks you to reconnect with your heart center in order to understand what the next right step is. Get clear, not only about what your desires are, but also what’s underneath them. When you move through the world with honest and kind energy (the combo is the key! ), those around you will be inspired to support your cause. Wednesday 9/26 - Whale medicine is all about primordial memory, collective consciousness, and universal wisdom. Today is most definitely a day to trust your gut, that deep inner knowing that can serve as your most powerful compass and guide in the life. If you don’t feel strongly connected to your intuitive abilities (we all have them; it’s just a matter of cultivating your gifts), take some time today to tune into your senses of smell, sight, sound, touch, and hearing. Practice exploring them, one at a time, and you might just begin to notice signals and synchronicities that have been trying to present themselves to you. Thursday 9/27 - When Raccoon shows up in the reversed position, it’s usually a sign that we need to practice more compassion and generosity, especially with ourselves. If you’ve been in a funk or have run yourself ragged taking care of others, it’s time to let the flow of energy circle back around to you. If there are people around you who are offering to support you in some way, allow yourself to receive! If you don’t have people in your life who can show up for you at the moment, take some for yourself to recharge in whatever way is most nourishing to you. Friday 9/28 - Spider reversed can have a number of meanings, but on the heels of the Autumnal Equinox, the message coming through seems to be one about balance with regard to masculine and feminine energy. Almost everyone carries both masculine and feminine qualities (not to be confused with be male/manly or female/girlie). The masculine embodies discipline, guidance, responsiveness, decisiveness, and stability. The feminine embodies expressiveness, playfulness, intuition, creativity, surrender, and flexibility. Most of us have a tendency to lean more towards one side of the spectrum or the other and today, Spider encourages us to look within and ask ourselves how we might create more balance in the energies that we embody. Saturday 9/29 - Hummingbird is the messenger of joy and when she shows up in the reversed position, she’s letting us know that we have been blocking our connection with the things that light us up and bring us true happiness and fulfillment. Simplify your life. Remember what made you smile and laugh as a child. Focus on simple pleasures like sunlight on your skin, the breeze in your hair, or the taste of a delicious meal. It is only when we have nourished our own spirit that we can take our work out into the world to serve others. Sunday 9/30 - Weasel reversed says one thing loud and clear: BE HONEST. With yourself. With others. And while you’re at it, tune into your Spidey senses and ask yourself how you feel around others. Are there people in your life who leave you feeling confused or spun around? If so, it might be time to give yourself a little space from those relationships so that you can reconnect with your own center, feel into your truth, and then live it through your words and actions. Monday 9/17 - This week kicks off with a message from Spider telling us it’s time to exercise our gifts of creative expression. Whether it’s through movement, visual arts, vocal work, or writing, be sure to take some time today to allow yourself to open up to the channel of Divine inspiration. Use your creativity to release something that you no longer wish to carry or to spread an empowering message. Your gifts are not random, but are intricately linked to your purpose during your time on earth. Tuesday 9/18 - Have you been feeling frozen in place? Rabbit in the reversed position indicates that it might be a good time to pause and analyze your situation before making any moves. To avoid getting caught up in fear traps, take a little bit of a time out today to soothe your nervous system so you can get a clear perspective and choose your next course of action from a calm and centered place. Wednesday 9/19 - When Crow shows up reversed, the message is about living in integrity and doing what is right, not because we ‘should’, but because we are living from a place of harmony within ourselves and with all of creation. Ask yourself today what shifts you might make to allow your presence to be one that uplifts the energy of any space you grace while still being true to your own heart. Thursday 9/20 - Today, Skunk appears in the reversed position to remind us to be mindful of what kind of energy we are putting out in the world and how it impacts other’s perceptions of us before we even open our mouths. Have people been responding to you in ways that leave you feeling confused or misunderstood? If so, it might be time to reflect on how you’re showing up and if some simple shifts in how you speak or carry yourself might pave the way for more authentic and enjoyable interactions going forward. Friday 9/21 - Toward the end of the week, Beaver in the reversed position indicates that you may be experiencing a block in your creative or professional flow. Have you lost interest in the work that you do? Are you paralyzed by perfectionism? Or are you simply just burnt out? Allow the medicine of Beaver to help you find the source of your energy leak and then make the appropriate repairs or adjustments necessary so that you can continue to share your unique creative gifts with the world. Saturday 9/22 - Snake slithers in today to share its medicine of transmutation with you. This is well-timed on the heels of Beaver because Snake medicine supports shifts in consciousness, physical states, and spiritual growth. What are you ready to shed? Who do you want to become? Today’s the day to allow the new you to emerge. Sunday 9/23 - As we close out the weekend, Moose medicine comes into play and helps us integrate the pride and self worth that comes from acknowledging your strengths, gifts, and innate value. There’s nothing arrogant about loving yourself and in fact, deeply rooted self esteem allows for a grounded self confidence that is incredibly magnetic. Love yourself up today and celebrate the unique presence that only you bring to this world. 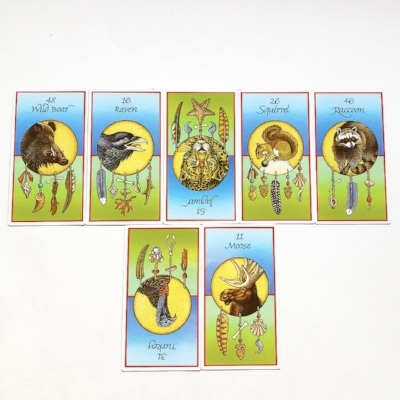 Monday 9/10 - At the beginning of this new week, Grouse reversed is letting us know that we must first ground our own energy before we can direct it effectively towards the manifestation of our hopes and dreams. This makes perfect sense as we continue to navigate the energies of an earthy new moon in Virgo for the next day or so. Take some time out today to dance, walk, spend time out in nature, and if you can, get your feet directly on the earth. Once you are reconnected to your center and to Source energy, you will be much more able to call in the opportunities and shifts you’ve been seeking, and more ready to navigate them gracefully from a place of alignment as well. Tuesday 9/11 - As we head into Tuesday, Deer reversed beckons us to approach our inner world and feelings with compassion, particularly with regard to fear. Fear is not something to be shoved down or run from. Avoidance only pushes those parts of our experience into our Shadow where it festers and manifests as shame, projections, or judgment. Instead, work on cultivating a radical acceptance of yourself, the parts the are easy to celebrate, as well as the ones that you may not be so quick to embrace. Explore your fears with curiosity and offer yourself the loving encouragement you would give to a small child. No matter how many years we’ve walked upon the earth, we all need a little tenderness and support from time to time. And the kinder and more gentle we are with ourselves, the more able we are to share those qualities with those around us. Wednesday 9/12 - When Skunk scampers into the cards, you know it’s time to share your unique essence with the world. No more sliding by unnoticed or muting your frequency. Allow who you truly are to shine through so that you not only attract in the things that are most in alignment for you, but also repel all that truly isn’t. Skunk medicine is powerful medicine and can clear pathways of obstacles if harnessed and channelled properly. Just make sure that you’re intentional about the energy you emit and be prepared to back it up with action when the time is right. Thursday 9/13 - Today, Porcupine is giving us a playful reminder to stay open-hearted and curious. When was the last time you allowed yourself to be filled with wonder and pure joy? As children, we are receptive to all of the magic and beauty of this world, but as we move into adulthood, we often begin to close ourselves off by developing tunnel vision towards goals or putting up armor around our hearts. Allow yourself to drop back into that innocent state that once came so naturally to you and you might be surprised by the abundance that flows your way. Friday 9/14 - As we move into the weekend, Swan invites us to surrender into the flow of life and let go of any need to control. This doesn’t mean to move through life with no sense of will or agency, but involves an active acceptance of the highs and the lows that we all navigate over the course of our days. When we stop resisting our own experiences and take the path of equanimity, we tap into the universal heartbeat, our connection to source, our creativity, and our intuition. 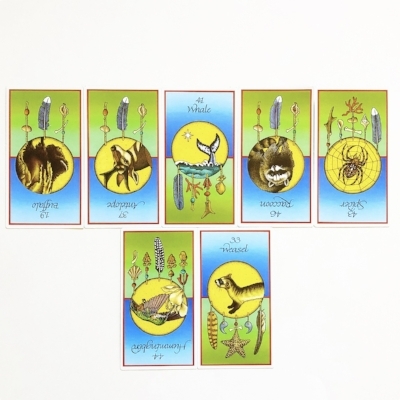 Saturday 9/15 - When Bat is found hanging upside down in the cards, it’s generally a sign that you’ve been stalling your own growth or transformation. Have you been so busy clinging to an old way of being that you’re not able to welcome in change? Life will push us towards our destinies no matter how hard we fight it. Make it easier on yourself and step willingly into the path that you know is meant for you. Sunday 9/16 - Dog medicine is that of loyalty but when Dog appears in the reversed position, it usually indicates that you may need to look at whether or not you’ve been true to yourself and to those you care about. Have you been struggling to be the kind of friend you wish to be in relationships with others? Have you been unkind or not trustworthy towards yourself? If so, today’s the day to recommit to showing up as your most honest, loving, and dependable self. Both in relationship with yourself and with others, you only get what you give. Monday 9/3 - This Monday, Raven helps us kicks things off with a bit of magic and as we move towards a new moon in Virgo on the 9th, it’s the perfect time to use infuse your words and practices with extra intention. Just make sure that you are very clear about what you desire, because you might just get whatever it is that you call in today. Tuesday 9/4 - Speaking of falling under spells, you may want to exercise a little extra caution and discernment today as Coyote reversed indicates that a trickster may be in your midst. It might even be you! Have you been getting in your own way, tripping over games you’ve laid out, or finding yourself lost in mazes in your mind? If so, the first step is to laugh at yourself lovingly and then consider if there are other approaches that might better serve you. Wednesday 9/5 - Have you been pushing yourself too hard and burning the candle at both ends? Prairie Dog reversed is letting you know that it’s time to take a break and some much needed rest. In our work hard, play harder culture, true restoration may seem like a frivolous luxury but, unless you want to run yourself right into the ground, it’s absolutely vital right now. See if you can carve out even a little bit of time today to do something truly relaxing and nourishing. If you can spend the whole day doing things that feed your soul, even better! Thursday 9/6 - Now that you’ve had a little time to recharge, Antelope is here to help you spring back into action. But this isn’t about doing things just to busy yourself. It’s about efforts that are aligned with your higher purpose. What is most important to you? What legacy do you wish to create during your time on the earth? When you can answer those questions, you’ll know what the next right steps are. Friday 9/7 - When Porcupine shows up with it’s belly up, it’s an indicator that you’ve become to guarded. You can’t receive with a closed fist, so open up and allow love to flow into your life. It’s true that vulnerability and intimacy can be scary, but they pave the way for some of the greatest gifts of life, so dig deep, call on the courage inside your heart, and take a chance today. Saturday 9/8 - On Saturday, Jaguar slinks in reminding us of the importance of integrity. This is not to be mistaken for self-righteousness or perfectionism, but is simply a consistent commitment to walking your talk and living from a place of humility, kindness, compassion, and honesty. Spend a little time today connecting with your deepest values and redefining how you can make your life an active expression of those qualities. Sunday 9/9 - As we enter new moon time, Dragonfly swoops in to let us know that shifts are in the air. As dynamic, ever-evolving beings, we are constantly in a state of transformation and where that process leads depends greatly on how intentionally we approach our lives. Harness the manifestation power of the new moon and the medicine of Dragonfly today to get clear about what shifts you would like to create in your life. If you can spend some time in ritual, whether that’s journaling about your visions, meditating, or simply connecting with the earth, definitely do so today. The whole universe is conspiring to support your dreams today, so take advantage of this potent time! Monday 8/27 - This week starts off with beautiful manna energy from the Dolphin. Take time to really tune into your sensual experiences and celebrate the beautiful gift of your own life. Allow yourself to open up to a deeper connection with Source energy, either through time spent in nature or a breath meditation, and you may even receive insights or wisdoms today. Tuesday 8/28 - With Fox popping up, you might want to consider dropping out of the spotlight and allowing yourself to blend in or go unnoticed today. Particularly if you've been unsure about relationship or work matters recently, take this as an opportunity to observe quietly and gather information that will help you determine your next course of action. Once you’ve had time to assess the situation from a place of stillness, you’ll be able to move quickly and decisively. 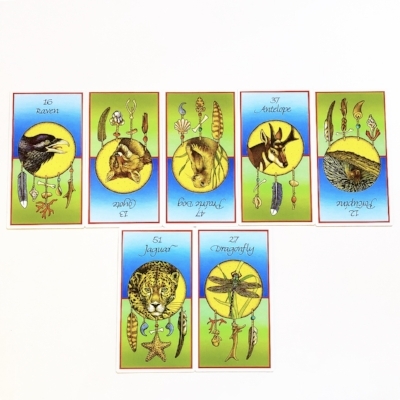 Wednesday 8/29 - If you have been pushing, pushing, pushing lately and are starting to feel worn down, then it’s time to connect with the medicine of Prairie Dog and retreat. Whether that means unplugging from work and taking a much-needed personal day to really immerse yourself in self care practices or backing off of a conflict you’ve been entangled in to allow the tension to settle and perhaps even a resolution to arise naturally. Sometimes less is more and today is definitely a day to subscribe to that motto. 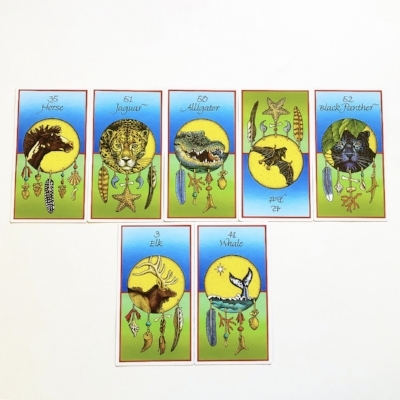 Thursday 8/30 - When Jaguar shows up in the reversed position, it’s generally a sign that you may want to do a little personal inventory to determine how well your actions are aligned with your values. If you notice that you’ve compromised your own integrity by acting in ways that harm yourself or others, right your wrongs by making sincere amends and committing to showing up with with an honest and pure heart in all that you do. Friday 8/31 - As the week comes to close, Antelope in the reversed position guides us to take action. Where have you been procrastinating in your life? What have you been avoiding addressing? Have you been giving your power away? If so, it’s time to take charge of your life once again. What can you tackle today that will help you release any feelings of helplessness and step into a sense of empowerment? No more stalling--it's time to just do it! Saturday 9/1 - What better day than a Saturday to reconnect with your inner child's natural innocence, open heartedness, curiosity, and joyfulness. Porcupine medicine reminds us to drop the armor we have gathered around us over the years and to allow softness and vulnerability to lead. This medicine is not to be confused for weakness, but is in fact one of the strongest and most courageous ways of meeting the world. Sunday 9/2 - On Sunday, Grouse joins us and reminds us to make our every move a celebration of the truly miraculous circumstances that have led us to find ourselves here, at this moment in time, on this very special blue planet. If you have the opportunity to spend some time in moving meditation today, take it! Whether that means dancing, walking, running, practicing tai chi or some other form of movement that helps you connect to the universal pulse that beats through all living things, make sure that you allow yourself to be fully embodied and present to the magic of your own existence. It's a surefire way to end the weekend on a nourishing note that will leave you energized and inspired for the new week ahead. Monday 8/6 - This week is starting off with Alligator medicine, and in the reversed position, this is an indicator that you’ll want to look below the surface of circumstances, words, and feelings today. Before making any decisions, tune into your intuition. Ask yourself what you might be missing at first glance. Consider the long term impacts of your choices. Taking time to integrate the wisdom you’ve gathered across your years with the insights you can draw from your present experience will be your best bet today no matter what comes your way. Tuesday 8/7 - When Dog shows up in the reversed position, it is usually a sign that it is time to ask yourself where in your life have you been disloyal, particularly to yourself. When we live in ways that are not aligned with our truth, we build up insecurities and resentments. To free yourself from these energies you must find the courage to show up authentically and this always begins with being honest and compassionate with yourself. Wednesday 8/8 - Beautiful Hawk is the messenger of the animal world and any time he shows up in the cards it’s definitely time to keep your eyes, ears, and heart open to receive guidance from Spirit. Messages can show up in all forms, from the words of strangers to unusual occurrences and synchronicities to feeling as if you are hearing someone speak to you in quiet moments when you’re alone. Listen closely. The messages may not make logical sense at first, but over time, their guidance will become clear. Thursday 8/9 - The medicine of Armadillo is its strong, armor-like shell that protects it in times of danger, but all medicines can be abused and Armadillo in reverse signals a time to soften your defenses and allow yourself to be vulnerable. Remember, when you block out hurt and pain, you also block out love and pleasure. Healthy boundaries that are neither to soft nor too rigid will allow you to connect with yourself and others more deeply and find that balance between softness and strength. Friday 8/10 - Bear reversed indicates that some time spent alone, reflecting on your own desires and goals is called for now. While it can be beneficial to seek the input of others occasionally, you are ultimately the only one who knows what is right and true for you. Take time to connect with your own inner knowing and honor its wisdom today. Saturday 8/11 - Blue Heron follows Bear to encourage you to continue on the path of self reflection. It is through honest examination of our own essence and ways that we discover our true strengths, weaknesses, and destiny. The more intimately you know yourself, the more you will be able to show up in the world with a balanced and grounded sense of confidence that serve as a beacon for all of the opportunities that are meant especially for you. Sunday 8/12 - Wild Boar is helping us close this week on a powerful note and encourages us to confront life head on! No more procrastinating or beating around the bush. No more hiding from your true feelings or sweeping them under the rug for the sake of others. Being open and direct can be one of the quickest ways to cut through drama and clear out any confusion. Be bold and face your fears so that you can move into the new week ahead free from nagging worries or doubt.